Gloster Aaron, Jan Naegele and Laura Grabel. Three Wesleyan professors have been awarded a four-year, $1.49 million grant by the state of Connecticut’s Stem Cell Research Advisory Committee. The grant will help fund research on using human embryonic stem cell-derived GABAergic neurons for epilepsy therapy, which is being conducted by Janice Naegele, professor of biology, professor of neuroscience and behavior, Laura Grabel, Lauren B. Dachs Professor of Science and Society, Professor of Biology, and Gloster Aaron, associate professor of biology, associate professor of neuroscience and behavior. This grant was the largest single award to researchers in this year’s competition. Only 23 projects were selected to receive funds from a pool of 109 applicants. In patients who have an initial precipitating event, such as a head trauma, a severe seizure can cause a loss in inhibitory GABAergic interneurons. This, in turn, can dispose an otherwise normal brain to generate spontaneous seizures, a condition known as temporal lobe epilepsy (TLE). These spontaneous seizures can further damage the hippocampus and lead to memory loss and other cognitive and emotional disturbances. Because nearly one-third of TLE patients are unable to control their seizures with drugs, Naegele, Grabel and Aaron are seeking novel, stem cell-based treatments for the disease. They have developed methods for producing GABAergic progenitors from mouse and human embryonic stem cells. In their proposal for their grant, they proposed three projects to thoroughly evaluate grafts of these neurons in mice with temporal lobe epilepsy. In addition to the collaboration between the three Wesleyan labs, the researchers have established collaborations with colleagues at the University of Connecticut Health Center and the Yale University School of Medicine to provide additional expertise for this project. According to the New Haven Register, Wesleyan researchers were awarded $1.48 million, the single largest grant in a new pool of state funding for stem cell research. The labs of Janice Naegele, Laura Grabel and Gloster Aaron are working together to studying stem cell therapies to treat temporal lobe epilepsy. Jan Naegele, professor of biology, professor of neuroscience and behavior, made two presentations in 2013. On March 12, she spoke on “Promises and Pitfalls of Stem Cell Therapy for Brain Disorders” at the 17th Annual Meeting for the Israeli Society for Biological Psychiatry in Kibbutz Hagoshrim, Israel. On March 26, she spoke to the Middlesex Elderly Service Providers on “Stem Cell Therapy for Brain Disorders” in Middletown. On June 11, Naegele will speak on “GABAergic interneuron replacement for temporal lobe epilepsy” at the University of California-Irvine. Jan Naegele is one of 19 women faculty in the country to receive a Drexel Fellowship. Jan Naegele, professor of biology, professor of neuroscience and behavior, was named a 2013-14 ELATE (Executive Leadership in Academic Technology and Engineering) at Drexel® Fellow for the 2013-14 academic year. Naegele and 18 other women faculty in science, technology, engineering and math fields, received the fellowship. They come from a range of universities and colleges across the country, many with global experience. 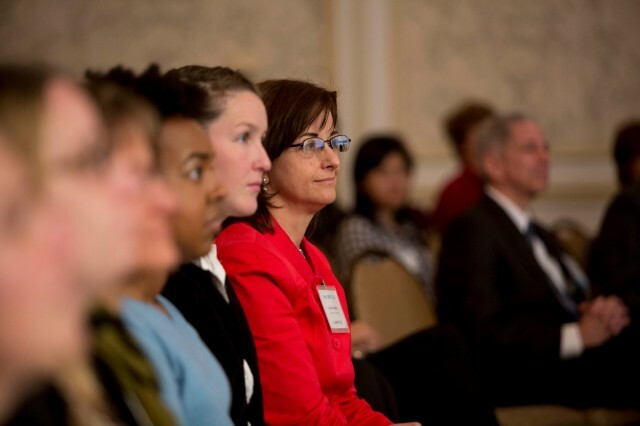 The ELATE at Drexel® Fellow program focuses on increasing personal and professional leadership effectiveness, leading and managing change initiatives within their institutions, using strategic finance and resource management to enhance the missions of their organizations, and creating a network of exceptional women. Facilitated by leaders in the fields of science, technology, engineering and math research and leadership development, the curriculum includes classroom lessons and activities, online instruction and discussion, and on-the-job application at each fellow’s home institution. In addition to learning about the financial planning and resource management in this program, each of the fellows has a project that they develop over the year-long program. The work for this second incoming class begins in May with online assignments and community building activities, and the program will conclude in March 2014 with a symposium organized around their projects. Naegele will begin the first of three week-long, in-residence sessions on July 31 at the ACE Conference Center in Lafayette Hill, Pa.
More more information visit Drexel’s website. On April 3, several Wesleyan faculty, staff and students joined world-renowned stem cell researchers at the StemCONN 2013 symposium in New Haven. 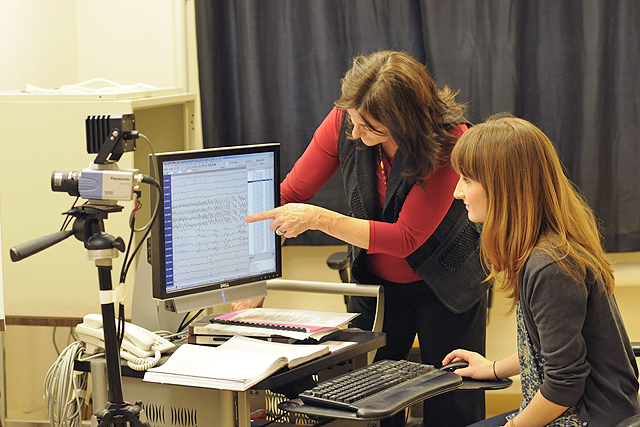 From right to left, Janice Naegele, professor of biology, professor of neuroscience and behavior, Katharine Henderson, research assistant, and Chelsea Lassiter, Ph.D candidate in biology. Janice Naegele will become director of the Center for Faculty Career Development on July 1. Naegele, professor of biology, professor of neuroscience and behavior, has served as chair of the Biology Department, and has served on the Educational Policy Committee, Review and Appeals Board, the Graduate Liberal Studies Advisory Committee, the Life Sciences Building Committee, and the Writing Certificate Committee. She has published extensively in the areas of developmental neurobiology, stem cells and translational rodent models of neurological disorders. Her research explores genetic, small molecule, and neural stem cell based treatments for cognitive disabilities and epilepsy. 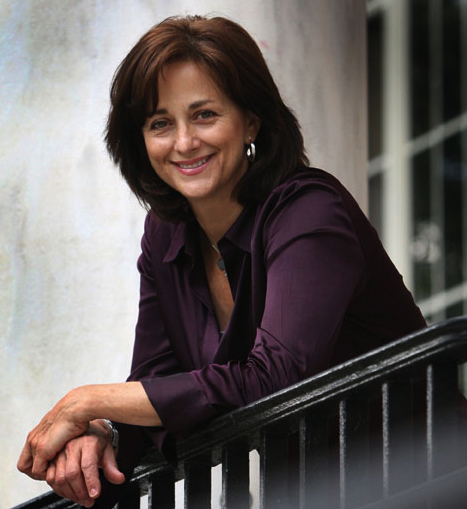 She currently serves on advisory committees for the Epilepsy Foundation and the American Epilepsy Society, and editorial boards for several scientific journals. She has received career development awards from the Klingenstein Foundation and National Science Foundation, and scientific research grants from the McKnight Brain Disorders Foundation, American Epilepsy Society, National Institutes of Health and Connecticut Stem Cell Research fund. In addition to continuing the mentoring and teaching resources that are currently offered by the Center, Naegele plans to offer workshops to assist new faculty, including a survival skills workshop for science faculty as they set up their laboratories and establish funded research programs. She is also interested in expanding resources and mentoring to recruit and retain underrepresented minorities across the disciplines. Naegele will be replacing current CFCD Director Sean McCann, chair and professor of English. Janice Naegele, professor of biology, professor of neuroscience and behavior, and Laura Grabel, the Lauren B. Dachs Professor of Science and Society, professor of biology, were recently honored in Hartford Magazine’s “Amazing Women” issue. Two of only 13 women selected this year for recognition, Naegele and Grabel were lauded for their contributions to the field of stem cell research. Janice Naegele, professor of biology, professor of neuroscience & behavior, and Laura Grabel, Lauren B. Dachs Professor of Science and Society, professor of biology, were recently honored in Hartford Magazine’s “Amazing Women” issue. Two of only 13 women selected this year for recognition, Naegele and Grabel were lauded for their contributions to the field of stem cell research. A recent report by William Weir of The Hartford Courant highlighted the efforts of three different research lab groups at Wesleyan that are all working toward the same goal: using stem cells as a possible way to treat epilepsy. 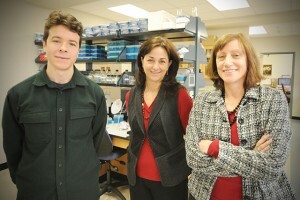 The labs are overseen by Laura Grabel, Lauren B. Dachs Professor of Science and Society, professor of biology; Janice Naegele, professor of biology, professor of neuroscience and behavior; and Gloster Aaron, assistant professor of biology, assistant professor of neuroscience and behavior. Their work was profiled in a Wesleyan Connection piece recently, titled: “Future Stem Cell-based Therapies for Treating Epilepsy Explored in 3 Biology Labs”. For the roughly one-third of temporal lobe epilepsy patients for whom drugs are not an option, researchers at Wesleyan are paving the way for alternative therapies using stem cells. Biology Department faculty members Gloster Aaron, Janice Naegele and Laura Grabel work together to create novel cell replacement therapies for temporal lobe epilepsy. Faculty members Janice Naegele, Gloster Aaron and Laura Grabel, together with Xu Maisano, Ph.D. ’11, Elizabeth Litvina, B.A. ’10/M.A. ’11, and Stephanie Tagliatela, the lab manager in the Naegele lab, recently published a landmark study in the Journal of Neuroscience on the use of embryonic stem cells to treat temporal lobe epilepsy (TLE). The researchers derived neural “parent cells” in culture from mouse embryonic stem cells, and transplanted them into the brains of epileptic mice. There, the transplanted cells differentiated into mature inhibitory neurons and successfully integrated and formed connections in the host brain over the course of several months. The paper, published Jan. 4, is available to read online. “In these experiments, we are attempting to repair an important region called the dentate gyrus, located deep inside the temporal lobe in the hippocampus. The structures affected in temporal lobe epilepsy are important for forming memories and controlling the spread of seizures throughout the brain. When inhibitory neurons in the hippocampus are injured or die off, seizures are able to spread into other brain regions, causing more severe seizures,” explains Naegele, professor of biology, professor of neuroscience and behavior. 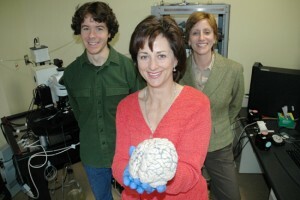 An article written by three Wesleyan faculty and two alumni was published in the January 2012 issue of the Journal of Neuroscience, 32(1): pages 46-61. In “Differentiation and functional incorporation of embryonic stem cell derived GABAergic interneurons in the dentate gyrus of mice with temporal lobe epilepsy,” the authors describe embryonic stem cell derived neuronal transplants for treating temporal lobe epilepsy. The authors include Jan Naegele, professor of biology, professor of neuroscience and behavior; Gloster Aaron, assistant professor of biology, assistant professor of neuroscience; Laura Grabel, the Lauren B. Dachs Professor of Science and Society, professor of biology; Xu Maisano Ph.D. ’11; and Elizabeth Litvina B.A./M.A. ’11. Xu was the lead author. This study is part of a larger effort between three biology labs (Naegele, Aaron, and Grabel) to study embryonic stem cell therapies for temporal lobe epilepsy. In this large, multi-year study, the authors show that embryonic stem cell derived neurons can develop into the major type in inhibitory neuron that degenerates in severe temporal lobe epilepsy. Because these interneurons reside in a part of the hippocampus that controls the spread of seizures throughout the cortex, when these neurons are injured or die off, seizures are able to spread throughout the hippocampus and into other brain regions, causing a more severe seizure. “We believe that these findings are of high importance for developing stem cell based treatments for brain repair and regeneration,” Naegele explains.